Losing your electric service is a huge concern. Once the power goes out you no longer have a working refrigerator, freezer, electric water heater, lights and anything else that takes a bit of juice to run. So, this makes an electrical service loss an emergency situation. Our electrical service experience means that while it may be a new emergency to you, your electrical problem is not new to us and whatever it may be, we have faced it before and know how to fix it immediately. Why call our Concord Electricians? 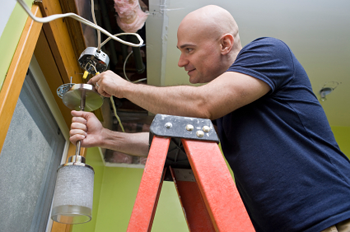 Our Concord electrical contractors can usually respond to an emergency situation immediately. If there happens to be a rash of electrical incidents in the area there may be a slight delay, but we almost always can get to your home with our same-day service. Emergency electrical situations demand emergency electrical service, and we’re happy to provide it. We are fortunate as a Concord electrician to employ and retain such a highly skilled workforce of craftsmen and mechanics who enjoy what they do. Working carefully and efficiently, we treat your home with respect while ensuring the job gets done right. There are a variety of electrician associations that can help you locate and identify a quality electrician. When you are ready to hire an electrician, don’t be afraid to ask if they have a license and who issued it to them. There is nothing wrong with you checking the credentials of any electrician you are planning on hiring. What the license proves is that they have met the state-mandated study hours and curriculum so that they can do the job right for you. You can never be too careful and checking the credentials of anyone you hire is always a prudent move. Your choice in providers should be there for any repairs and installation needs you have but also help you to improve and update your home with energy saving solutions like the educating you on the benefits of a whole house fan installation cost.